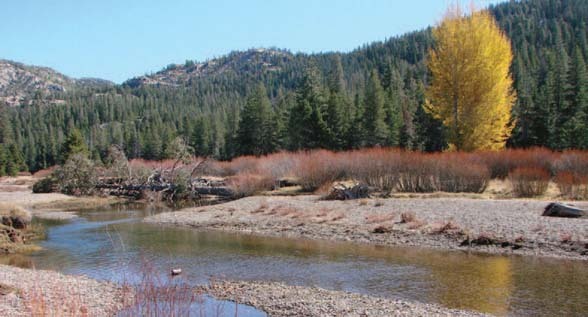 The deep Sierra terrain opens to scenic Hermit Valley, where the Mokelumne River becomes the centerpiece of an open meadow teaming with wildlife and wildflowers. Hermit Valley sports a rustic, dispersed U.S. Forest Service campground and access to hiking and four-wheel drive trails. 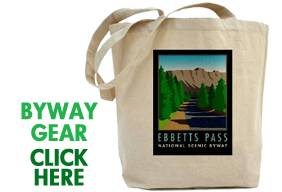 In 1856 a road was completed from Murphys to Hermit Valley, following the old Emigrant Trail, which turned northward from Hermit Valley via Faith and Charity Valleys to Hope Valley and joined the Carson Pass Road or “Mormon Route” to the north. 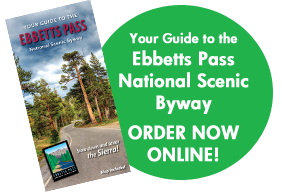 This route crossed over the Border Ruffian Pass (thought by some to have gotten its name from the Border Ruffians, members of the outlaw Joaquin Murrieta’s gang), and was used by early emigrants and prospectors traveling over the Sierra crest. After silver was discovered in 1861 on Silver Mountain, a few miles east of Ebbetts Pass, another route was rapidly completed from Hermit Valley to the silver mines and beyond to Markleeville (the approximate route of today’s Highway 4), and Border Ruffian Pass then became less important as a trans-Sierra route. A tollgate, known as “Holden’s Station,” was established here in 1864. The settlement that grew up around the hotel became headquarters for the Mokelumne and Highland mining districts. By the early 1880s, the area became known as Henry Adams Ranch, which was coined as “Adams Hotel” in the 1890s. The area was later the livestock range of the Stevenot family of Angels Camp, which extended all the way to Blue Lakes. The U.S. Forest Service established a summer home tract of five residences in the 1920s along the North Fork of the Mokelumne River, on the south side of the traveled route, where the Stevenot cabin was located. Bedrock mortars in a granite outcrop in the west end of the meadow attest to a much earlier occupation by MiWuk and Washoe people who traversed the pass in hunting, gathering, and trading expeditions.